3D MP3 Sound Recorder G2 allows you to mix your recording with background music on the fly. So you are able to add music to your presentation , record karaoke , mix music etc. Click the background setting button to open the configuration window. This is what you wanted as the background music. you can use almost any type of audio and video file , as long as you can play it on your PC. For a video you won't see the video, but you can get the audio from the video file. Specify the percentage of background and your recording in the mixed file. Specify how you will mix the background in the destination audio file. you can put the recording and background in same channel or in different channel. You can choose to repeat the background when you continue record, or continue record without background , or stop recording automatically. Enable this option, you can hear the background music from your speaker when you record. Press down the "Apply" button for background music,. 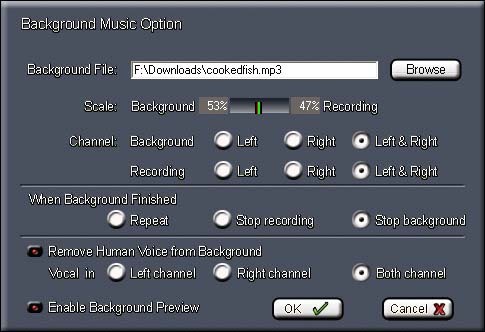 when your start recording, the background will be applied to your recorded file according to your settings. As shown in the picture, you can adjust the scale in real time when you record, so you can add background fade in and fade out effect to your presentation.